The Gaggia range offers unbeatable value for money, and innumerable cafes, bars and restaurants rely on Gaggia to make fantastic coffee. If it's the latest functionality and style you're after then the Gaggia Deco might be right for you, or perhaps the Gaggia D90 for its iconic, timeless look. 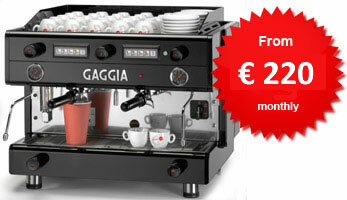 If low-cost is the order of the day, the Gaggia LC/D or Gaggia XD are great economical choices. Whichever Gaggia you decide upon, you'll get unparalleled reliability, combined with a coffee machine that brews the espresso shot flavours with a delicacy and refinement that will bring customers back to your place for more. We have been agents for Gaggia in Ireland for the last 15 years, and our experience and reliable after-sales service makes Gaggia a winning choice for your business. How do I make great espresso? Coffee jargon - can you help? We run regular training sessions, so as a new Gaggia owner, you can be sure you're getting the most out of your machine. Read more about getting to know the potential of your Gaggia machine. Using the right coffee machine accessories will help to improve your enjoyment of your coffee machine, and your coffee-making skills. You can swirl your milk like a pro Barista using the bell bottom cappuccino foaming jug, or tamp with precision using a perfectly fitting 58mm aluminium tamper. Find out more. This is a full sized commercial 2 group coffee machine with a 13 litre internal boiler and a 4.3kw electrical element. The model has a single steam arm positioned on the left hand side with a hot water outlet on the right. The LC/D is a low deck machine and a 12oz takeaway cup can fit underneath if the pouring spout is changed on the coffee group handle. An espresso shot jug can be used for larger takeaway cup sizes and glasses. 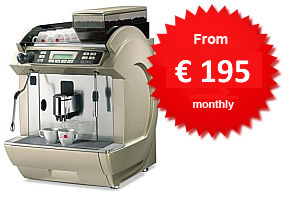 A Gaggia MD 64 automatic fill grinder is offered with this. This is a prestige top of the range Gaggia 2 group coffee machine. The D90 Alti is a tall cup model in that it allows for takeaway cups and latte glasses to fit underneath the groups. It has two steam wands, a hot water outlet, 13 litre internal boiler and a 4.3 kw element. For many people, this machine is the finest coffee machine ever made. A Gaggia MD 64 automatic fill grinder is offered with this. The Gaggia Concetto is an automatic bean to cup coffee machines with a recommended daily capacity of up to 120 - 150 cups per day. It comes with a coolbox with temperature display which can be placed beside the machine or in the counter directly underneath the machine. The concetto makes Latte, Cappuccino, Espresso and Americano at the touch of a button and it has a steam wand for milk foaming and making hot chocolate. The Americano is made using hot water by-pass and the cafe latte drinks can be programmed to have 'layered' effect in glassware if desired. A tall glass or 12 oz takeaway cup will fit underneath the coffee dispensing area. Daily cleaning is simple and straightforward and is supported by telephone help, cleaning guides and a YouTube tutorial, if required. A 50 second on-line demonstration is available to view on Watermark.ie. Two machines can be joined together to make it look like one unit if required making it faster to deal with higher volume in rush periods. 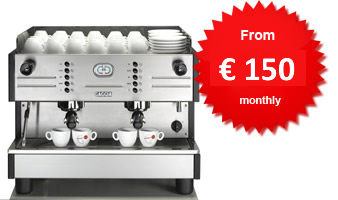 The monthly rental cost is €195 plus vat per month and the equipment is new and unused prior to installation. Replace with a brand new machine every 2 years: You can avail of a new coffee machine every 2 years reducing the cost of unexpected down time and the hassle that comes with this.